It will increase its weight in Europe, starting with Germany, and it will slow down its entry into Brazil. Industrias Puigjaner has started a new strategic plan that is scheduled to increase its turnover by 54% in the coming four years. The objective focuses on surpassing the 11 million Euros with which it closed 2014, reaching 17 million in 2018. This increase will occur mainly in export markets. The company is celebrating its 130th anniversary this year, designing and manufacturing machinery with the Denn brand, to deform metals by rotational processes (lathes, circular cups, rotary forging, and cutting and swaging appliances, for pulleys and pipe closing). In other words, machines that are used for the subsequent preparation of circular-shaped elements made of sheet metal or tube, from laminated tyre rims and discs for the automotive sector, to fuel tanks for the European fighter plane, OFF200, and also including the finish of lids for pans and casserole dishes, water bottle mouth sealing and parts for industrial ventilation equipment and ornamental lamps. This company, which manufactures capital goods for automobiles, aeronautics and ventilation, exports up to 95% of its turnover. “This percentage varies slightly from one year to the next, because during this crisis there have been years when we have not sold anything in Spain. In 2014 we noticed a positive reaction in the local market and this year’s perspectives seem to be good. But we are putting everything into sales abroad", states the company’s CEO, Joan A. Puigjaner. Thus, the first intention of the plan is to grow in Europe with new products, especially in Germany; “where we have our three main competitors in the Euro Zone”. The European weight in the business is too small compared with the United States that accumulated 40% of the income last year. Even so, Puigjaner, has exclusive technical service and distribution companies in France, Italy and Switzerland, and it participates in four European research projects. “They come to us, because we are very specialised and ours is a small company that incorporates research, which is not normal. Adding an SME adds points to consortiums. We have to enter these projects through technology centres such as Tecnalia (Basque Country) and the CTM of Manresa, Ascamm and the UPC", explains this fourth generation family member. The will to increase presence in Europe contrasts with the project in Brazil: “We had the possibility of forming a mixed company to supply the South Cone, but we have curbed the attempt because for us the situation in the region is not clear”, Puigjaner underscores. This re-orientation of the international strategy does not affect the company shared with a local partner in China, Denn Yangzhou, which maintains its activity, “although it has slowed down lately”. 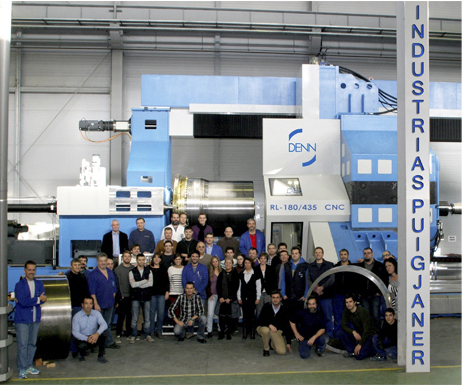 The company will boost its main US market with its own after-sales service, which is very important for customers of the Puigjaner Denn machines. The company earmarks 7% of the turnover to R&D. “It is a very high budget, bearing in mind that the average in Spain is 2%”, states Puigjaner. This high technological level will permit an increase in specialisation to solve problems for customers. Industrias Puigjaner was created in 1885 (it still preserves a document with the first tax paid, amounting to 50 cents) in Barcelona, and it has the oldest Spanish licence to construct machinery. La Maquinista Terrestre y Maritima beat it by one year, but this company, which later derived into Alstom, abandoned the machinery producing activity some time ago.